This is a listing for 3 bracelets. The bracelets are completely handknotted, which means a knot between every pearl. The bracelets are 7.5 inch long, average size. These beautiful handknotted bracelets are made with 6mm (small but not tiny) south sea shell pearls with a beautiful luster, silk and finished with a sterling silver spring clasp. The SMALL and delicate sterling silver charm is 8mm, including the loop. Please leave a message at the checkout if you want a personalized gift tag on top or inside the gift box. PLEASE ALLOW UP TO 2 WEEKS FOR ME TO MAKE THIS BRACELET, SINCE A LOT OF TIME IS INVOLVED IN MAKING A HAND KNOTTED BRACELET. FOR MULTIPLE BRACELETS, IT MAY TAKE A LITTLE LONGER. The bracelet will be made 7.5 inch long, including clasp. This is an average size, fits most women. If you need it to be longer for a bigger girl, just let me know. Once a bracelet is made (hand knotted), they cannot be made longer, only shorter. So please do not order smaller than 7.5 inch. The shell pearl is laboratory made from the shell of an oyster. The process of making a shell pearl involves several different stages. The raw material for the base of the pearl is the sea shell, which is coated and polished to the final shape of the pearl. 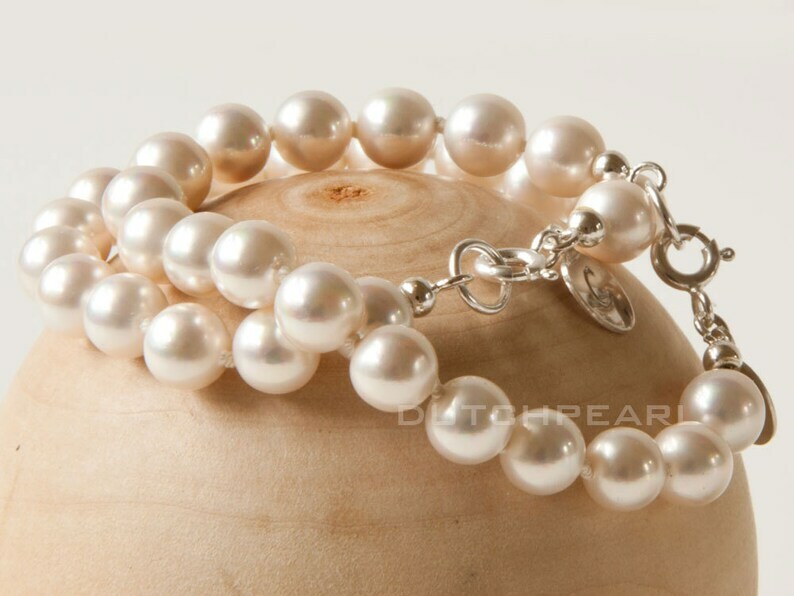 In order to produce a good quality pearl, a key ingredient is what we call a 'mother of pearl bead'. This element adds weight, value and durability to the pearl. These pearls are considerable better quality than other simulated pearls and often pass the 'abrasion test' used to identify natural and cultured pearls. In fact, the materials used in order to make shell pearls are the same materials from which cultured pearls are made. The shell pearl will always keep its shine and color, and will not be affected by sweat, perfume or detergents. My sea shell pearls are known for their incredible lustre and I'm very happy they finally arrived! Stunning beauties! They have the expensive look, without paying the price. They have a beautiful soft luster. Your bracelets come in giftboxes as in the picture, with a color of satin ribbon of your choice! The bracelet will be made 7.5 inch long, including clasp. This is an average size. These handknotted bracelets are a perfect gift for yourself, your bridesmaids or someone special.